Early April 2013 a story on social media started immediately “going viral”. 72,000 people shared a story called, “PARENTS PUT 16 YEAR OLD DAUGHTER UP FOR ADOPTION AFTER LEARNING SHE IS GAY”. Almost as suddenly as the story had taken off, it halted. Blushing page administrators started removing it quickly as details, such as the family living in “Southern Carolina” pointed to a growing understanding. The story was fake. It was, in fact, a satire from the site Deacon Tyson Bowers III. For a teenager named Corey, the story not only could have been true, it WAS true for him. It happened two years earlier than the social media fraud. Corey did not have an easy life. He was a popular jock guy in high school, but by the age of 15, he had been handed more than his share of abuse. His parents were conservative, religious, on welfare and dabbled in narcotics. His birth father beat Corey at times, and neglected him at others. Corey was raised with a belief that gay people were not only sinners, they were sin itself. His birth father made sure that Corey was aware that gay people all were killed at some point before they reached old age. Corey had been meticulous about keeping his sexual orientation a secret. He was athletic and he was popular as a “ladies man”. “It was all to keep everyone from knowing,” he told me. Finally he started telling some of his extended family. 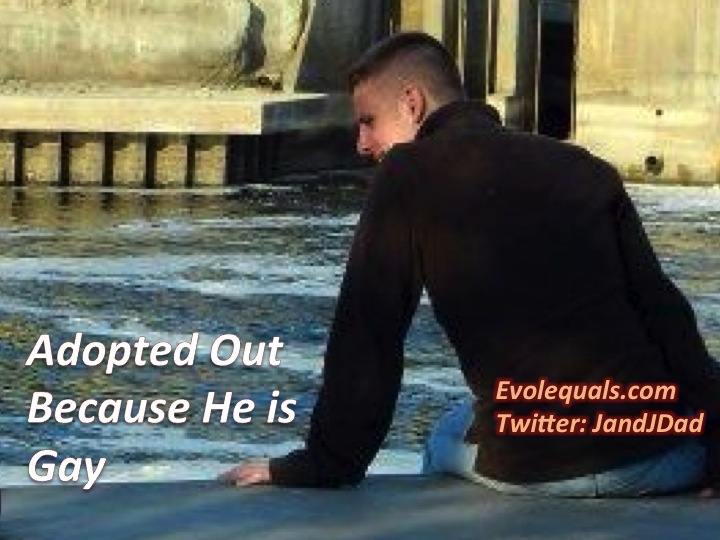 This left him feeling exposed and vulnerable at home. If the subject were to come up, he was no longer in a position to deflect and hide as he had been before. Whatever security he had felt before was gone, and his self doubt and self loathing were at all time highs. One evening, the issue of sexual orientation came up, in a big way. As Corey prepared for an evening at a family relations’ house, a news story about gay rights came on the television. Corey reacted with a subtle positive endorsement. His birth father exploded, “If any fag lived in this house, I would shoot them in the head with a shotgun” he screamed. Corey bolted from the house immediately. He was feeling feverish, scared and sickened. Did his father know? Was that a threat for him, or just a reminder that he lived in a den of hatred? At the party, Corey got drunk, and physically sicker. He ended back at home and as fever raged, his despair imploded into his gut. His parents, suspicious, ignored him. Several days later, at 2 am in the morning, he was up, unable to sleep, delirious and suicidal. Forty minutes later, Mindy and Aubrey were at the trailer in which Corey lived with his family. He came out and got in their van. His father wandered out and demanded to know what Mindy was doing. The normally honest to a fault Mindy heard herself telling a lie. In a casual nonchalant demeanor, especially one for almost three in the morning, she heard herself say, “Oh hi! Sorry to disturb. We had invited Corey to go to the mountains with us. We thought an early start would be best.” Corey’s birthfather turned flirty and asked Mindy when she was going to come take HIM to the mountains. Mindy laughed coyly, played the part and flirted right back. After a few minutes, the van was on its way, with Corey in it. For the next few weeks, Corey’s birth parents did not inquire as to where he was. Finally, nursed back to health, he returned home and the growing awareness of his homosexuality again became the unspoken issue. Finally, he decided to confide in his mother. He figured that she was oppressed and passive, and likely to keep it to herself. That was not the case. She called Corey’s birth father who stormed home and broke into the house railing at the top of his lungs. “He was yelling and screaming about how a fag was living in his home and he can’t believe the devil was in his presence. I locked myself in my room when my brother came home. The first thing my father did was tell him about how his brother was nothing but a worthless fag,” Corey recalled. All three family members tried to break into his bedroom for hours. Later they retreated, and Corey escaped to the bathroom with a much stronger door and lock. He sat in a corner of the bathroom with his possessions in a paper bag, afraid for his life. In the wee hours of the morning, when the three had passed out, he escaped the house—never to return. He went back to his friend Aubrey’s house. This time, it was not just Aubrey and Mindy to his rescue. Dad Dale, and brothers Andrew and Mason all stepped up as they had during his illness. The family had come to love him. For them, he belonged. He was home. They did not know at first that he was gay. They just understood that he needed them. When they did find out that he was gay and had been driven from his former home because of it, it did not matter, not even to conservative dad, Dale. They already loved him, and for some unapparent reason, they seemed to need him too. The next year was a challenge for all involved. At first the birth family created noise. The small community also backlashed against Corey’s new family. Andrew and Aubrey were both taunted at school for going after a gay brother, and some of Mindy and Dale’s family and friends out and out rejected them. The family got a court date. They were extremely nervous and had documented all the events leading up to the request for official guardianship. They watched the door of the courtroom waiting for their adversaries to arrive. They waited and watched. Time passed. Corey’s birth family did not show up. They had no apparent argument to contest the adoption-like arrangement, no concern. Their offspring was gay and they signaled that they were perfectly willing to have him be in someone else’s family as a consequence. For Corey, Mindy, Dale, Aubrey, Andrew and Mason, the day became known as “Gotcha” day. A family got Corey, and he got them. Aubrey, Andrew and Mason became tireless advocates for Corey and LGBT rights in general. Eleven year old Mason, who previously had been disinterested in things outside of a little boy’s world made a rainbow freedom art project that he dedicated to his new big brother. In those encounters, Dale does not say much. He turns and walks away. Quietly, inaudibly, he whispers, “I have news for you. He is not your boy. Listen to a podcast radio interview with Corey and Mindy here. Would you like to reach out and give a home to another teen like Corey? Contact www.raiseachild.us . This entry was posted in Family, Living, Prejudice, Religion and tagged Adopting LGBT teen, adoptive parents, Cathy Kristofferson, Corey adoption, Deacon Tyson Bowers III, giving teens up for adoption, Homeless teens, homophobia, Rob Watson. Bookmark the permalink. I was already tearing up then that last paragraph made me out right bawl!! “He’s my son.” Brought new tears to my eyes.